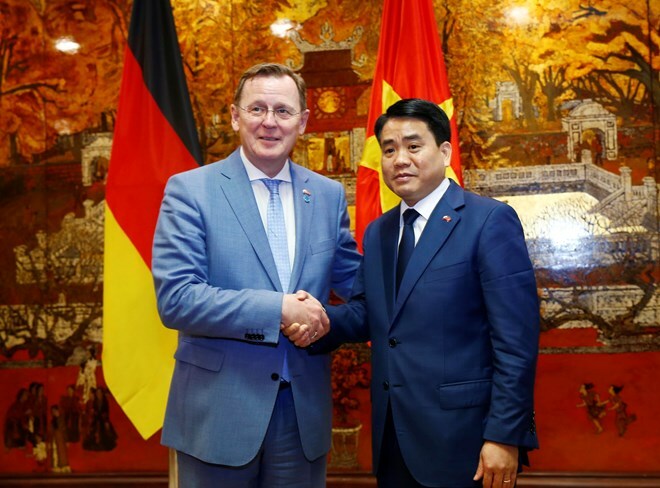 Hanoi (VNA) – Hanoi is willing to collaborate with and facilitate German firms, particularly those from Thuringia, to invest and operate in the city, stated Chairman of the municipal People’s Committee Nguyen Duc Chung. The official made the statement while receiving a visiting delegation from the eastern German federal state, led by its Minister-President Bodo Ramelow, on April 8. Chung said he hopes the sides will exchange more delegations to gain experience and come up with additional specific cooperation projects, particularly in labour affairs, vocational training, high-tech medical equipment supply, digitalisation, and smart city building. He informed his guests of Hanoi’s socio-economic development over the years. Accordingly, the capital led the nation in terms of foreign direct investment (FDI) attraction last year, with its provincial competitiveness index ranking ninth among Vietnam’s 63 provinces and cities. Chung also pointed to major challenges facing the city, like training high-quality workforce, as well as tackling traffic jams and pollution. He noted that in order to deal with such challenges, boosting cooperation with European countries, including Germany, is a priority. He added that advanced technologies from Germany, and particularly Thuringia, will be useful for Hanoi. For his part, Ramelow lauded the fruitful growth of joint work between Vietnam and Thuringia. He revealed that companies in his state spoke highly of Vietnamese interns. He hoped Hanoi will remain a trustworthy partner of Thuringia. Agreeing with his host, he said the sides should step up their experience exchanges and collaborate more in environmental pollution treatment and vocational training support.